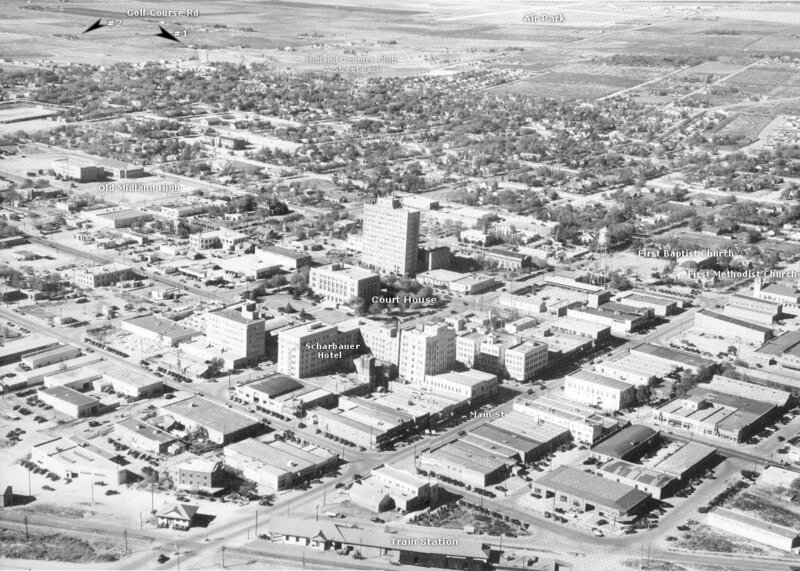 Midland, Texas in 1947 just as the post war energy boom was beginning. Golf Course Rd. is noted at the top....it was the northern boundary of the Midland Country Club golf course which occupied what is now "the duck pond" off of "A" St. The First Methodist Church is in it's present location with the old First Baptist Church directly across Main St. Midland High, shown, soon afterwards became Cowden Jr. High and is now the site of the Fasken Towers office complex. The two arrows at top indicate the homes of the Bedford family, for whom my street was named. #1 was a spanish style house around the corner from our home, that stood until the 1980's and was located at the corner of "D" and Harvard streets, a vacant lot today. #2 is another spanish adobe that still stands at the corner of Garfield and Cuthbert. Photo courtesy of David Lindemood and historic assistance provided by Wilbur Yeager.